A generally-perceived disadvantage for cyclists on the roads – frequently not being “visible” to car drivers – was turned into a hoon-busting positive for NSW Police Sergeant Matthew Bransdon last year while on duty at the Dubbo show. Part of the bicycle patrol unit, Sergeant Bransdon and another officer could see and hear burn-outs at an intersection, then two sets of smoking tyres when the lights turned green. Riding into view, they waved down the two “street racers” and booked them. “They just didn’t expect to see a police officer on a bike,” he says. The fact that bikes can intermingle so well with the streetscape is an aspect that is a large part of the effectiveness of having police officers on bicycles. “We’re just not expected,” Sergeant Bransdon says. “We can literally ride up and catch these people in the act.” Combine this with the naturally better view of surroundings that cyclists generally have, and the bike squad has been an outstanding success for front-line crime-fighting purposes such as drug detection and apprehension, not just on the streets but also in parks and gardens. Sergeant Bransdon is the state co-ordinator and principal tutor for the NSW Police Bike Unit, and among other duties undertakes all training initiatives for the unit. Proper training is a must for officers in the police bicycle unit, combining the skills of sometimes rigorous riding with the demands of active policing duties. The skills required can almost be dubbed “parkour-for-bikes” – with trainees expected to master manoeuvres such as mounting and clearing gutters and drains as well as off-road obstacles like tree branches, rocks and logs. The aim of training, says Sergeant Bransdon, is for officers to be able to proficiently negotiate everyday urban obstacles and, especially if in pursuit or called upon for rapid response, maintain speed. These moves require bike police learning what he calls the “power-up” technique and also the “pre-load” technique. Riding towards an obstacle, even a simple kerbside gutter, the rider moves into a position that for want of a better description could be called “doing a mono”. “You lift up using both the strength in your legs and the right gear selection to be able to power up and over the obstacle,” Sergeant Bransdon says. Training also has police-specific moves. Officers learn to use the bike itself as a tool to delay or detain perpetrators, and they can be an effective shield when the need arises. A bike can also be used to block off an area to members of the public, and be used to “control” an area that is bigger than an officer on foot can claim. 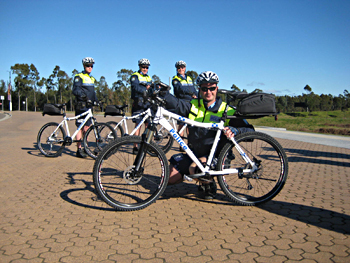 Trainees and also experienced bicycle police are helped greatly by the style of bike used by the NSW Police. The custom-made state-of-the-art mountain bike was designed “by police, for police” at the bike unit especially to meet the demands that the squad’s personnel face day to day. Made by Sydney firm Hillbrick, the force has just ordered 100 of the next model to come from the bike unit’s drawingboard, called the Firetail. Of course, being a government department, there are budgetary considerations as well. Each police bike is expected to have an effective life of about five years. “We’ve identified that an aluminium frame has a generally accepted fatigue life of around five years,” he says. “So starting with that ‘frame life’, we look at fitting componentry that will match that.” After “use-by” is reached, the bikes are generally auctioned off. The unit’s expert team working under Sergeant Bransdon – Brett Barnes, Steven Weekes, Andrew Dunspan, and Kevin Boyle – are responsible for developing the custom-designed mountain bike, which is fine tuned as cycling technology improves, and which also allows for effective and purpose-focused training. Of course it is the purpose of police bicycles, and their intended use, that influences the design. “We’re not there competing, we’re out there patrolling,” Sergeant Bransdon says. “So we wanted a bike that could afford a more upright position, one that would not stress the neck for example.” Keeping an officer comfortable throughout a shift is important, so the bikes’ ability to be tuned for a wide variety of body types also had to be considered. Police have found that patrolling by bike is very versatile, and very effective. The bike unit is called upon to attend many major events such as the Royal Show, the Dubbo Show, the V8 Supercar event at Homebush and the Tamworth country music festival, as well as many others. At these sorts of events, the two-wheeled patrols come into their own. “The bikes are very flexible in terms of what can be done,” Sergeant Bransdon says. “You can get around fast, and travel a surprisingly large distance in a short time, and cover a large area.” At a music festival, for instance, he says the unit may have a half-dozen or even a dozen police on bikes, but the affect can be like having scores more officers on the ground, as the bike patrols can move around the crowds so much more – and an impression of a high police presence greatly helps crowd control. All police on bikes are sworn officers, which means they are armed and fully kitted with all appointments and utilities. NSW Police now has load-bearing vests as an optional part of the uniform, which will be a handy option for bike patrol officers as all the required equipment can be carried on these. Bicycle unit police are also supplied with a hydration pack, multi-tool, spare tube – all the basic essentials to go riding. As far as effective policing goes, the bike unit has been a runaway success. They tackle all the tasks one would imagine fits well with the transport choice – traffic control, community patrol and so on – but the bicycle unit’s strong point is in the area of intelligence and information gathering.